Like when my Banana Shoulders finally dropped after months of playing! 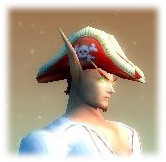 Note that you don’t have to be exalted with the pirates to get the hat, just friendly. I did the grind for bloodsail rep twice…. (so far), I have an old warlock named Veldock, in which i did the grind. Then I had a healer friend who wanted the rep and since I was already hated with Steamweedle I helped him. It only takes around 6-8 hours of continual grind… and considering fishing takes about that to get to 300 or so.. its really not too bad.. but it does vary on your current standing with the goblins.. (veldock, had rev. with all but everlook when he started).